Earnest is building a better bank that democratizes access to high-quality financial services. 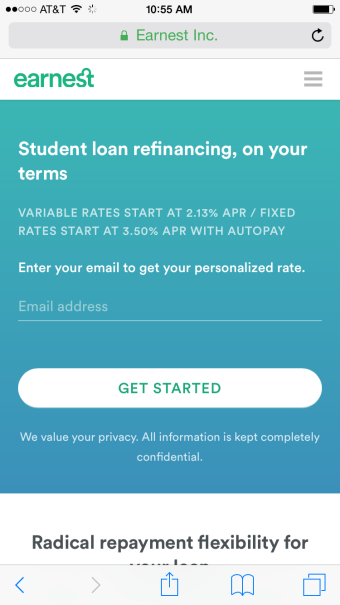 The three-year-old company’s first offerings are student loan refinancing and personal loans, and they’re competing against well-established institutions like Wells Fargo and Bank of America. Earnest's differentiation is their friendly, clear user experience and their dedication to delighting clients. "In the absence of thousands of brick and mortar locations, the most powerful thing is word-of-mouth. And the only way to win word-of-mouth is by making people happy," said Craig Battin, Head of Growth Marketing at Earnest. One of the first places Earnest can deliver a standout customer experience is the web onboarding funnel, which requests an applicant’s financial information and presents them with personalized loan terms. The client can then choose his/her preferred terms and sign a loan agreement, which is Earnest’s main conversion metric. Here’s how Earnest experiments with their application flow in the quest to balance a stellar client experience and optimal conversion rate. "We prioritize relationships, not revenue," said Battin. "That's one of our core values here. A student loan refinance can be up to a 20-year relationship with that client, so we have to make sure they're having a great experience from day one." And day one starts with the application funnel, which is always under scrutiny by teammates from Marketing, Design, Product, Client Happiness, and other departments. Various stakeholders are always suggesting improvements through group brainstorms and submitting ideas to a backlog list. But the most important input comes from clients. Earnest’s Client Happiness team, which resolves support issues and has the most contact with clients, acts as the team’s eyes and ears. They attend weekly meetings with growth, design, and product to relay important findings, and let their teammates join “ride-alongs” to hear clients’ voices directly. If listening to clients is Earnest’s most important discipline for building a good client experience, the second most important one is iteration. Their team launches products quickly, then tests and improves them. “When you’re building products, you want to make them as perfect as possible. But sometimes three tests can get you there faster than consensus,” said Battin. Ideas for these tests come from teammates, conversations with clients, and their Optimizely partner CROmetrics. CROmetrics, a 3-Star Optimizely Solutions Partner, helps the Earnest team with strategy, prioritization, and testing throughput. “We all share the view that we should always test things and make them better, if not for efficiency's sake, then for the client experience,” said Battin. "CROmetrics was critical to the success of our program. In 2015, we ran 0 funnel experiments, and we ran over 100 in 2016." One of the smallest tests Earnest ran on their funnel had a huge payoff. Earnest collects more applicant data than a traditional lender, which enables them to make more holistic underwriting decisions and potentially offer lower, more fair interest rates. They had always stated that this information is kept confidential, but when they added the words, “We value your privacy,” conversions to the next page increased 5% and flowed down the funnel to the client’s final application submission. “If you think about the value of each of those words, it's insane,” said Battin. Of course Earnest values client privacy, and in fact, they’re required to be extra careful with client information because financial regulations require extra privacy protections. So this test hinted at a broader theme for future optimization: being transparent about the need for specific pieces of information from clients. The team continued to add short descriptions to the flow about why they need to collect certain information, and saw an increase in conversions from these tests as well. Another important yet counterintuitive test increased the funnel’s complexity but paid off in overall conversion rate. Earnest’s mobile flow had low conversions, due to the fact that complex tasks like connecting financial accounts are more difficult to complete on mobile than on desktop. The team hypothesized that being able to remarket to clients that had abandoned the application on mobile would increase the number of completed applications. The team introduced a gate where an applicant had to enter an email before they could reach the rate check form. This added an extra step to the flow, but it allowed Earnest to contact the potential client again over email, when they were on a desktop and more likely to fill out a long loan application. This captured some latent intent and increased mobile conversions by 15%, with more requests for a rate check on a mobile device and more remarketing application submissions on desktop. While one set of Earnest’s funnel tests adds information, another set ruthlessly removes it. 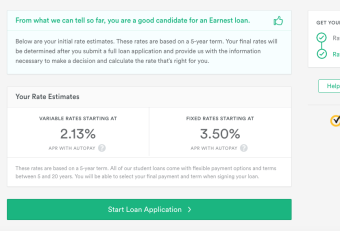 Testing revealed a big win when Earnest simplified their final “results” page, where they show the client their loan rate options. 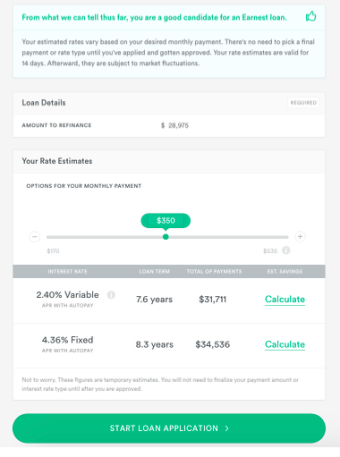 Originally, the page had an interactive slider where clients could explore their best rate among all their possible loan options. The team hypothesized that this was information overload, removed the slider, and only showed the two numbers that comprised the best option. Conversions to the next page jumped 70%, and a similar change on the next page yielded another 50% increase in conversions. Despite these positive results, stripping away all information isn’t always the best decision for the client, even if conversions increase. Loans are complex, and Earnest adds value by helping clients understand the process with context and complete information. Furthermore, regulations require prominent display of certain pieces of information. So for Earnest, it’s a matter of testing their way to a “sweet spot”—a balance of information in the search for a great client experience. Listening to clients is key to designing a good experience. Spend time with support teams and interact with users directly to build empathy and find optimization test ideas. Testing and iterating on a product is faster than trying to build consensus and launch a perfect product on the first go. Challenge assumptions about what your clients know and don’t know. Some sections of a user experience warrant extra explanation, while others perform better with less information. Test variations constantly. To learn more about the Earnest brand and products, follow them on Twitter, Instagram, LinkedIn, and Facebook.